Max Herndon, a 7-year-old first-grader at Edgewater Elementary School, is pink with pride this month. Since Oct. 1, he’s been wearing the color pink every day. 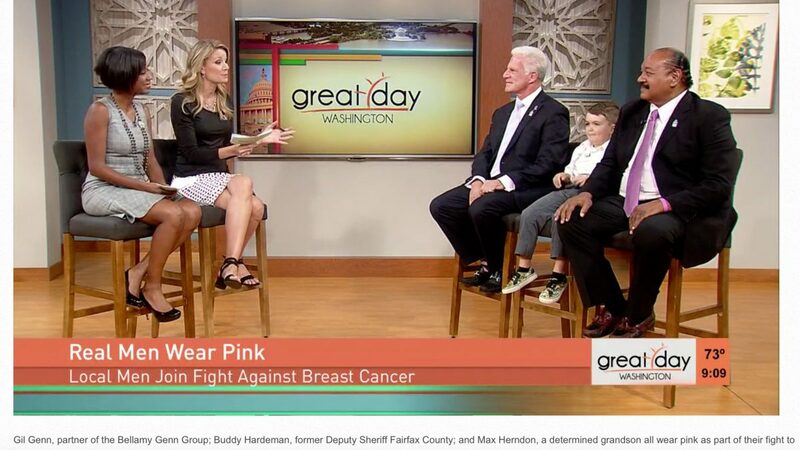 The youngster is one of 11 males throughout the region who are the Real Men Wear Pink of Washington, D.C., participants, part of a campaign to raise awareness and funds for the American Cancer Society’s Making Strides Against Breast Cancer program. It is the second year of the campaign. Other Real Men include Buddy Hardeman, a former Redskin running back; R&B singer Eric Roberson, plus Gil Genn, an Annapolis business owner and former Maryland state delegate. Max has a wardrobe of pink items: t-shirts, a bow tie, a set of suspenders and soccer socks. Max pairs them with shorts or pants with pink stripes or inserts or t-shirts printed with pink graphics. Or, he’ll borrow a pink hoodie from his mom and toss that on. He almost always wears a pink ribbon. Though pink was a color associated primarily with male wearers through the early decades of the 20th century, by mid-century, it became nearly exclusively a “female color.” Even now, a male sporting pink gets attention. His Nana, maternal grandmother Cyndy Geissler, was 41 when she was diagnosed with breast cancer. Geissler fought the disease until her death at age 52, a little more than two years before Max’s birth in 2008. Geissler was the only known relative to succumb to breast cancer, though two of Max’s great-grandmothers passed away from other cancers. Each Real Man in the campaign has set a fundraising challenge. The males are competing to be the top fundraiser by the end of October. Wearing pink heightens awareness of the Making Strides Against Breast Cancer program and aids in their fundraising efforts. The youngster’s mother, Brianna Herndon, works for the American Cancer Society. She said, from infancy, her only child accompanied her to numerous cancer fundraising events. “He always talks to the participants and it’s made him an empathetic boy,” she said, noting, he also enjoys soccer and Brazilian Jujitsu at Team Randori. 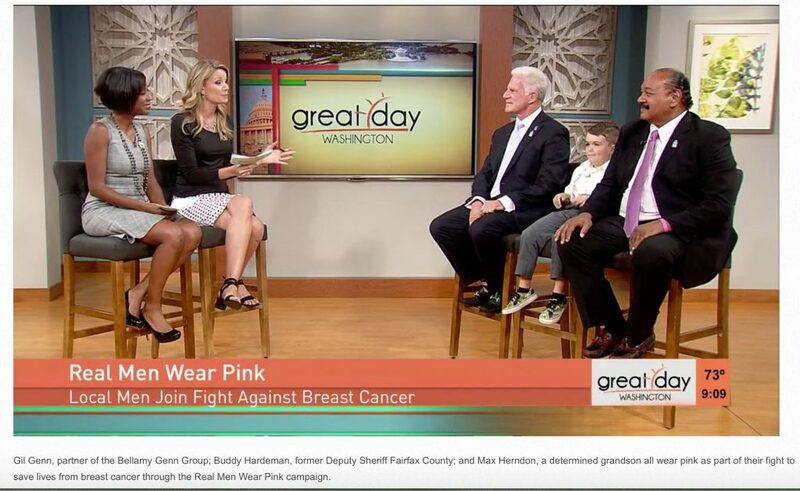 Max was the center of attention at a Real Men “reveal” party on Sept. 28 in D.C., and has made an appearance on a local TV talk show. His parents, Brianna and Dennis, are sharing Max’s appeal on Facebook and Twitter, while administrators at Edgewater Elementary have tweeted about Max’s campaign. The straight A student has raised nearly $2,000, in amounts from $5 to $100, on his website http://main.acsevents.org/goto/maxherndon . Gil Genn, a few decades older than Max, is also in the pink of things. A Maryland state delegate from 1986 to 1998, Genn said, “I’ve been wearing pink every day, including the classic pink ribbon on my lapel. I have pink ties, socks, and shirts in some type of pink, plus an all-pink golf outfit consisting of a pink polo and shorts. Brett Hovington of Capital Custom Clothiers in Annapolis loaned him a pair of pink mother-of-pearl cuff links to wear for business and formal events, plus some neck ties. 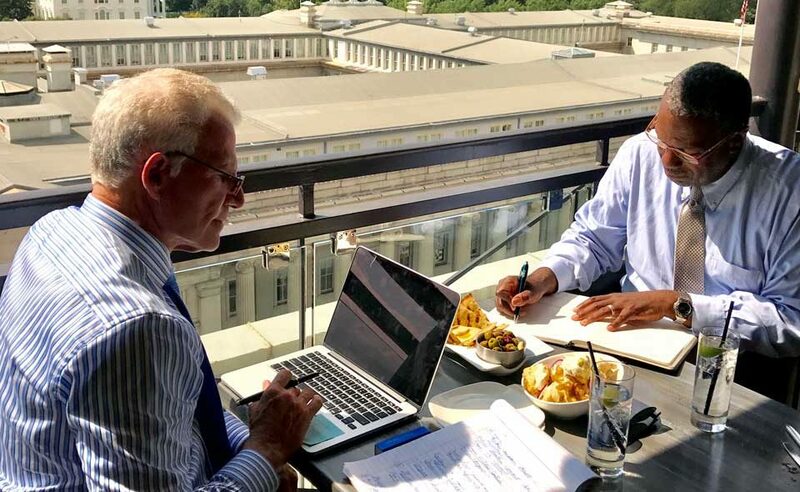 Now a partner in the Bellamy Genn Group, LLC, a new Annapolis lobbying firm, Genn’s initial involvement with breast cancer advocacy was during his first job right out of college. He was a member of the staff of U.S. Senator Birch Bayh of Indiana. “Marvella, his wife, was one of the first public figures to come out and say ‘I have breast cancer’ in 1971. She underwent a mastectomy followed by radiation and chemotherapy treatments. First Lady Betty Ford said she felt Marvella was an inspiration to all women with breast cancer,” said Genn. In 1974, Ford was diagnosed with breast cancer and had a mastectomy. He noted a sister-in-law Pamela Genn, diagnosed with breast cancer at age 29, is a proud survivor. “She had a mastectomy which is rare for someone that young. Our family lived through the diagnosis, fear and trauma, but more than 30 years later, she is a survivor. A good friend of his, Jacquie Cohen Roth, lost a sister to breast cancer and has an aunt who survived it. Like Max, Genn’s fundraising goal has a numerical significance. “I expect to meet and exceed my goal of $3,600,” he said. Genn said the number 18 is pronounced Chai in Hebrew, which also means the “significance of life.” He and Ms. Cohen Roth, whom he calls his “Boo,” are fundraising together and 18 times 2 is 36 and that’s why they set the goal of $3,600. Carrying a tote bag filled with pink donation collection canisters, Cohen Roth visited merchants along Maryland Avenue and asked them to place the cans in their businesses. They accepted her request, put the cans on display and are collecting change for Genn’s Real Men fundraising campaign. The Real Men website is www.MakingStridesWalk.org/RealMenWashingtonDC .